Confused about transactions you saw on the website? Take a look below to see if anything below answers your questions. Back in 2009, Jeff Aberle of Purple Row wrote a 9-part series describing all the rules associated with every MLB transaction that he could think of. These articles still provide great insight into the workings of MLB transactions, though some changes may have occurred since the creation of a new Collective Bargaining Agreement. If you would rather get a quick rundown rather than read through the entire series, here are some quick explanations for some of the more common transactions. A player designated for assignment is removed from the 40 Man Roster, and thus no longer counts towards the limit. If the player is currently on assignment to a minor league team, they are simultaneously unassigned from that team until their fate is known. Teams have ten days to trade, release, or attempt to outright the designated player through waivers. The player cannot be added back to the 40 Man Roster until they clear waivers. Players are generally DFA’d when the team needs to make a quick roster move to position another player to the 40 Man Roster, such as a player acquired through trade, acquired via free agency, or purchased from a MiLB contract. Optional assignments refer to players on the MLB 40 Man Roster being sent on assignment to minor league teams without actually leaving their MLB contracts. Every amateur player is granted three option years when they sign as a professional. 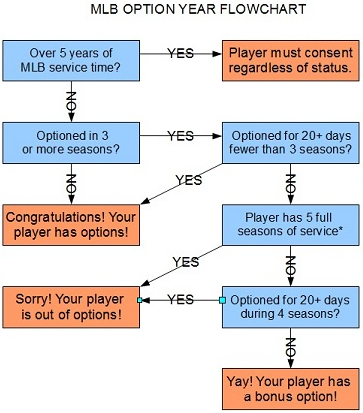 When people refer to “player options” or to players “having options”, they refer to the amount of seasons remaining during which the player can be sent down to the minors freely. It is important to realize that any player can, in theory, be optioned down, even if they are out of options or have enough service time to reject the assignment. There are, however, significant constraints on these players being able to be sent on optional assignment. Players who are out of options must clear waivers to reach the minors, while players who have more than 5.000 years of MLB service time may reject optional assignment regardless of how many of their option years have been exercised. In essence, “options” refer not to total potential optional assignments, which are unlimited in theory, but rather to seasons in which that player can be freely optioned to the minors with no chance of losing them to free agency or to another franchise via waivers. Option years are used only when a player spends more than 20 days in a season on optional assignment (or in other words, 20 days on the 40 Man Roster but playing for a MiLB team, discounting rehab assignment). Players who spend between 1 and 19 days on optional assignment do not see an option year used, but in return gain MLB service time for each day they were on assignment, while players on long-term option do not continue to gain service. Players on optional assignment do count towards minor league rosters and all continue to count towards the 40 Man Roster limit. Players may also qualify for a fourth option year in the event that they do not have “five full years of professional service time” upon using their third and final standard option. A full year of pro service time is defined as 90 days during any seasonal period in which the player is active on a MLB or MiLB Professional roster. Disabled list players are officially active, however in this case, only 30 days on the DL can count towards the 90 day requirement. If a player is active for 59 or fewer days and spends the rest of the season on the DL, the season will not count. Outright assignment occurs when a player is sent from their MLB Contract (40 Man Roster) to a MiLB Contract (minor league team). Players are regularly outrighted after already having been Designated for Assignment, but they can be outrighted at any time as long as they have cleared outright waivers. All players must clear waivers in order to be outrighted. Also, players may only be outrighted once in their careers without their consent. After being outrighted once, players may refuse assignment regardless of MLB service time, and will also be allowed to opt out of their contract at the end of the season regardless of years remaining on said contract. Players with more than 3.000 years of MLB service are also granted these rights whether or not they were outrighted previously or not. Because all players sent on Outright Assignment must clear waivers, these assignments take three days to complete, which is why players not already placed on waivers are designated for assignment first, as the team will get the roster spot before the player is cleared. Outright players are returned to the minor league contracts they signed with the team. If no minor league contract currently exists for them to return to, they are signed to a standard one year contract for the remainder of the current season. The Reserve List is a list on which incoming players (newly signed or traded players, as well as promoted/demoted players from within the organization) are generally placed until they have arrived with the team and are ready to be activated. There is no minimum amount of time a player can be placed on the Reserve List, meaning they can be activated at any time, unlike with the Temporarily Inactive List. A minor league player assigned to the Temporarily Inactive List is temporarily removed from active duty on the corresponding minor league roster for at least three days. The TIL is generally used for minor day-to-day type injuries, to create suddenly necessary roster space for an incoming player or as a short temporary leave for the player to settle other business, though players can remain on the TIL indefinitely for long term periods. Players may be activated from the TIL before the three day minimum if the corresponding roster spot was never filled by another player.